Johannesburg is South Africa’s largest city, and it is also home to some of the country’s biggest townships. 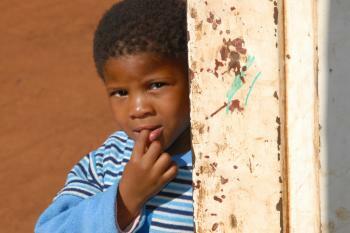 Here, thousands of children grow up in poverty, experiencing social exclusion from a young age. These children need support so that they can become confident and successful adults. Ennerdale is a suburb of Johannesburg which was built in the 1970s in an attempt by local authorities to create a new kind of township for the coloured ethnic group (also referred to as Cape Coloureds). The aim was to achieve economic self-sufficiency, while ensuring racial segregation at the same time. Apartheid urban policies are now a thing of the past, of course, but most poor townships of Johannesburg continue to be predominantly coloured communities. These areas of the city are often culturally deprived, with few amenities such as parks or arts centres. They also lack urban goods such as fresh and frozen food products, dry goods (e.g. flour for bakeries), often due to inadequate roads and access. Many townships face the problem that sewerage, running water and electricity are not sufficiently available or that the infrastructure is in dire need of repair. In addition, residents often do not own the land their houses are built on, so they are essentially illegal settlers – the government is therefore under no obligation to provide basic services. Johannesburg has a population of over 3.7 million today and it remains a deeply divided city. During apartheid, the city consisted of eleven local authorities: seven of them were inhabited by white people and were 90 per cent self-sufficient; four of them were inhabited by black and coloured people and were ten per cent self-sufficient. The city’s population has increased seven-fold in the past decades: around two-thirds live in poverty today and 72 per cent of them are black. Ennerdale is located in today’s Region 11, which is a predominantly black African, very low-income area, 70 per cent of which consists of informal settlements. This means that there are a great number of children here who are born at a disadvantage. They grow up in areas where poverty and deprivation are prevalent, crime levels are high, unemployment is rampant and education is not available to all. Right from the start of their lives, these children have a lowered life expectancy, higher chances of contracting diseases and of stunted growth. As a result their physical as well as their psychological and cognitive development is affected, and this in turn can lead to violence, aggression, delinquency, substance abuse and the disintegration of family life. Children growing up in poverty experience social exclusion and discrimination, making it hard for them to develop self-esteem. Once these children reach adolescence, their problems can intensify if they do not have a support network. 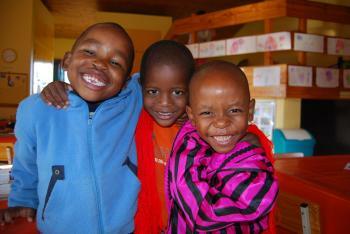 SOS Children’s Villages began its work in the Ennerdale suburb of Johannesburg in 1984. Family-strengthening programme: Today, our SOS Social Centre provides support to the local population. Our support goes out especially to those members of the community who have been affected by HIV/AIDS, and we also organise HIV/AIDS awareness and prevention campaigns. In addition, we assist struggling families by providing material support, for example by paying for children’s school fees and uniforms. We offer counselling psychological support and we give parents guidance on income-generating skills to empower them to become self-sufficient. The aim of all our activities is to maintain family stability so that parents can provide a loving home for their children. Care in families: For children in the region who are no longer able to live with their parents, 11 SOS families in Ennerdale can provide a loving home. In each family, the children live with their brothers and sisters, affectionately cared for by their SOS mother. Some of these families live in housing in different areas of town. The children attend kindergarten and school together with children from the neighbourhood, which ensures that they are integrated into the local community from a young age. Support for young people: When young people who grew up in one of the SOS families feel ready to move out of the family home in order to study, receive training or work, the SOS Youth Programme continues to support them as they make the transition into independent adulthood. Of course the young people also maintain close contact with their SOS mother and siblings.